This research action project (RAP) includes scholars who want to link their research to create positive social change in marginalized Latino Oregon communities. We will use our research in Latino Oregon communities to improve the social conditions marginalized Latinos face in Oregon. We will discuss the history of Latino growth in the state and conduct studies analyzing the structural barriers and opportunities Latinos face in Oregon. These issues may include, but are not limited to: access to educational opportunities; increasing awareness of public health issues; supporting the political and financial capital that exists within the Latino community; and examining equity issues facing the Latino community in Oregon. Research will provide historical, political, social, cultural, and economic understandings of the marginalization of Latinos in Oregon. Recommendations and strategies for improving the social conditions of marginalized Latinos will be linked to policy, community development, and social service interventions. The Latino Civic Participation Project (LCPP) collaborates with Oregon cities to engage Latinos by taking their ideas and needs into account through meaningful public participation strategies, and with the goal of increasing their representation and empowering them to participate in planning and public policy decision-making. 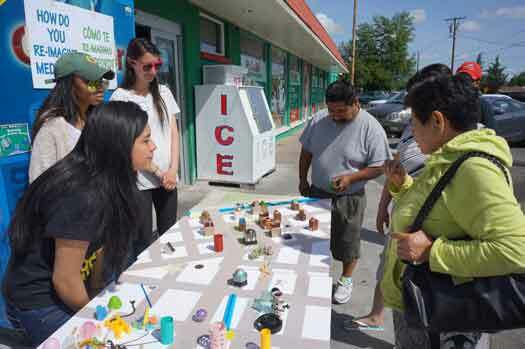 More than 1,000 Latinos have taken part in LCPP sessions in Medford, Eugene, and Springfield, and LCPP continues to widen its scope to other cities. ICP was an interdisciplinary program open to all UO graduate students. This program was intended to build graduate level skills in cultural sensitivity and was active for two academic years: AY 2012-13 and AY 2013-14. CLLAS, the Planning, Public Policy, and Management Department (PPPM), and the College of Education’s Center on Equity Promotion (CEP) have partnered to create a unique graduate student training program that provides crucial hands-on cultural competency preparation for diverse workplaces. The project is a two-year pilot program offering graduate students from any discipline both theoretical tools and hands-on experience in cross-cultural work environments. Students who participate in the program will complete three components: PPPM 552, Public Participation in Diverse Communities; a zero-week summer course focused on race, ethnicity, and culture in the workplace; and an internship focused on working in an intercultural environment. Scholarships to supplement internships are also available for participating students. The goal of the program is to help graduate students build skills in these areas in a way that their focused disciplines may not. CLLAS and CEP have developed important linkages with businesses, organizations, and government agencies throughout the state of Oregon. PPPM has developed effective systems for placing students in internships. We are thus excited for this opportunity to combine forces and provide an interdisciplinary program that meets the needs of graduate students soon to be looking for employment. The ICP was made possible by generous funding from the University of Oregon Graduate School’s Innovations in Graduate Education Awards. CLLAS hopes to eventually turn this innovative graduate training model into a Graduate Certificate. Information sessions held in October and November introduced students to the program. For more information, contact CLLAS assistant director Eli Meyer at emeyer(at)uoregon.edu.